Costume ideas – no problem. There are very definite ideas, usually decided weeks in advance. Sometimes it is a challenge to make those ideas come to life, like the cartoon character that must look exactly like the tv show. Other years, easy peasy, like the soldier which means pulling dad’s Army fatigues out of the closet, pinning to fit and adding an eyebrow pencil beard. Yeah, I know no facial hair, but I’m not going to tell an eight year old that. And I wouldn’t tell him that this isn’t ghost buster ectoplasm or green monster breath either – if that’s what he wants to call it. Halloween is all about suspending reality for a while. Isn’t it? Cider smoothie tastes like apple pie and ice cream through a straw – perfect autumn goodness. 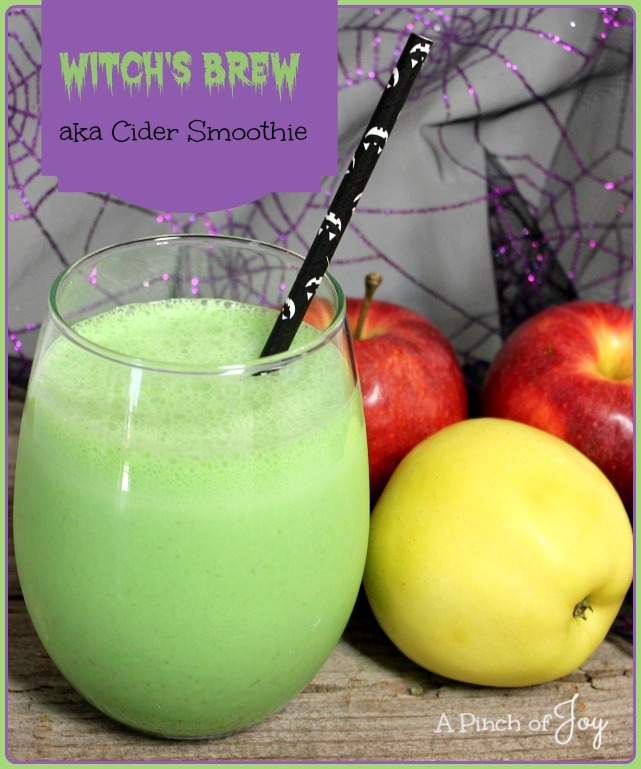 Color it green -- instant Halloween witch's brew! Put all ingredients in blender and blend until smooth and well mixed. Red or orange food coloring may be substituted for green if desired. Or food coloring may be omitted altogether.